It often does not occur to people to keep a locksmith’s number in their list of emergency contacts. People do not think, for instance, of locks and “locked out situation” until they find themselves in a fix. At that point, you start regretting on not keeping a locksmith’s number with you. 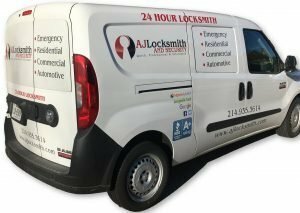 We at AJ Locksmith see several clients in the Dallas Metroplex area that are locked out and had to search for a reliable 24-hour locksmith. In that case and many others, our Dallas Locksmith service will be your best choice. Call us now for any lock and key related issue you may have. You never know when you might need a locksmith. In other words, if you could predict when you would lose your keys or lock yourself out of your house or your car, you will stop it from happening in the first place. Therefore, it is always a good idea to be ready and prepared. At AJ Locksmith we always encourage our clients to keep our number on hand. It does not take much time to store the number in your phone. In conclusion, if you find yourself locked out, you can quickly call our 24 Hour Locksmith Dallas to the rescue, we will help you. All of our Locksmith technicians are licensed and pre-screened. Also, we are always on call, ready to serve the entire Dallas Metroplex and neighboring areas. Most importantly, as a locally owned business, we care very deeply for our customers and always aim to provide them with the best quality of service. To sum up, we always respond promptly and do our utmost to help our clients in their time of need. Contact our reliable Dallas Locksmith now. No matter what kind of situation you find yourself in, our 24-hour locksmiths can help. If you need replacing your home locks or re-key them all, we can help! Our residential locksmith services are prompt and reliable. AJ Locksmith is licensed and insured which is highly essential. All of our locksmiths are well trained and skilled. We can install many types of high-grade commercial locks to keep your property protected. Besides, if you need to re-key or change your locks on either a retail shop, office, etc., you have come to the right place. No job is too big or too small! Do not worry if you lost your home keys or locked out of your car. With our fast response team, we can assist you anytime. Our 24-hour locksmiths can efficiently gain access to your vehicle or your house after they verify ownership.